Native American tradition provides that each individual is connected with nine different animals that will accompany each person through life, acting as guides. Different animal guides come in and out of our lives depending on the direction that we are headed and the tasks that need to be completed along our journey. "Turtle teaches us to be careful in new situations and to be patient in reaching our goals. Turtle also teaches us to take things slow, for it gives us time to figure out if we need to protect our self or forge ahead. 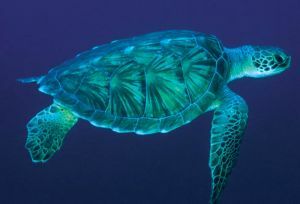 Turtle shows up in our lives when we need to go into shell and wait until our thoughts & ideas are ready to be expressed. He also teaches us to be adaptable to our environment so we can find the harmony within it." I have had many totems come and go out of my life but turtle is one that sticks around. I have always collected different turtles in my life and no matter where I was they would just seem to show up. Be it on the beach, in the woods or even in the roads. I remember all the times I would be driving and see 1 in the road, stop my car and move them off the street or back into the woods. 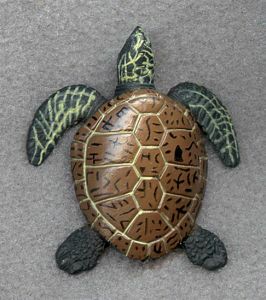 Sea Turtle isn't my totem, just *turtle* but I love these guys so I made my first totem tag of one. If you find this in a cache, please log it and it is yours to keep or pass it on! Had so many requests that I took him out of retirement and had it remade 1 more time before ithe mold is broken :) Should have it by the end of April.